Yesterday I happened to see that the documentary, The Quest of Alain Ducasse was showing tonight and decided I had to go see it. The French chef with 21 Michelin stars under his belt was just in the vicinity last week with the opening of his two restaurants in Morpheus, the latest over-the-top hotel to open in Macau. 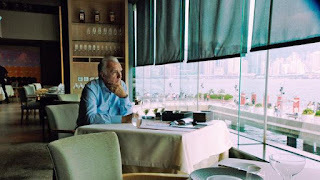 So I wanted to know what made the 61-year-old man tick -- and although the film shows scenes of the French chef tasting numerous delicious-looking dishes from Paris to London, to Kyoto and Hong Kong, we don't really know much about Ducasse himself. There are hardly any biographical details about him, how he was born in 1956 in Orthez, in southwestern France and that it was his grandmother's cooking -- the smells that wafted up into his room -- that got him interested in the kitchen. Ducasse revolutionized French cuisine, doing away with heavy creams and butter and opting instead for light, rustic cooking that showcases the freshness of the ingredients. He's also gone a step further in making his Parisian restaurant Plaza-Athenee feature vegetables and seafood but no meat. It is clear he is passionate about what he does -- he insists on servers pouring Champagne in front of guests and will personally rearrange the furniture too. He only has praise for his army of chefs around the world -- there are only minor details to be worked out in their new menu items. The dishes for him are practically perfect. Or is he saying this in front of the camera? What was completely glossed over in the documentary was a plane crash he survived in 1984. He and four colleagues were flying in a small plane from St Tropez to Courcheval in the French alps when the weather turned bad. They could have opted to land in Lyon, but they decided to press on when through the clouds they suddenly saw a mountain in front of them and it was too late to divert. He was thrown out of the cockpit into the trees, the only survivor of the crash, though he lost a lot of blood. It took him months to get over the trauma but it also made him look at life succinctly. "It helped me to realize what is important and what is not," he has said in an interview. "It taught me to step back from the kitchen, and open my eyes to the vastness of the world." And so The Quest of Alain Ducasse is a non-stop travelogue of him flying all over the place, constantly in search of new flavours, new ingredients, encouraging his staff and checking out possible business ventures (Mongolia, anyone?). 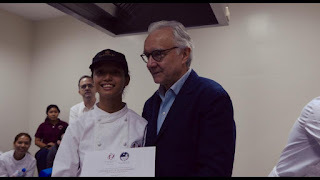 He has even started a culinary school in Manila where some street kids are taken in and trained to become cooks, sponsored by the man himself. He is moved listening to the young women thank him for giving them an opportunity to earn money for their families. When he visits China, he takes several of his staff to see a sturgeon farm for caviar two hours outside of Shanghai. There's a giant fish farm, rearing sturgeon that are very large. One of the most jaw-dropping scenes is watching a giant sturgeon sliced open, revealing millions of black caviar pearls. 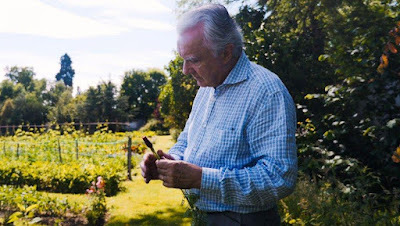 Ducasse has been advocating Chinese caviar for years and only uses them in his restaurants. In the tasting room they use mother of pearl spoons to scoop out large dollops and everyone marvels at how sublime they taste. 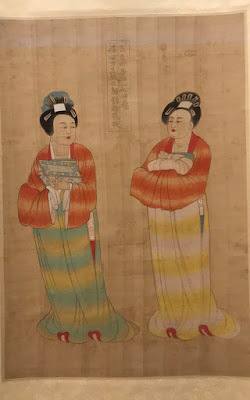 There are no scenes about his private life, only to note that he has four children, three of whom are young children. After watching the film I wasn't hungry, which was disappointing, but also how little I have accomplished next to this man who has how many restaurants around the world? But it's his relentless passion for food, curiosity about new things that make me realize that this is what keeps him going everyday. The old adage "Do what you love" definitely applies here and Ducasse is an excellent example.